Wow, great pic. Looks amazing. Must resist. Can't resist. Why not? I am worried what it looks like on a smaller wrist but it looks great. So, had been following this watch for so long, a few days busy and not looking, and THIS! Thanks for all the pics guys, looks every bit as amazing as I'd hoped, I need to make some funds as I have to have this watch! Mine just arrived today and I must say I'm really pleased with the watch! Top marks Eddie! It's a beaut!! I think Canada Customs liked it too. They felt they had to open it to inspect it. They must have approved because they let it through! Blimey, I really have been out of touch with this side of the forum...I missed a launch! 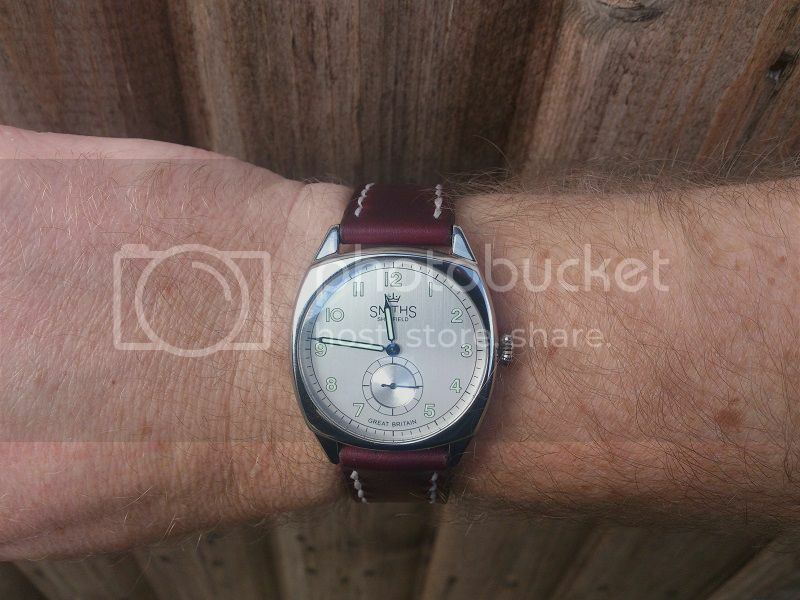 Beautiful watch in many ways...but I think that padded strap was the clincher! Ordered first thing this morning. As an aside, I've been wearing it since it arrived 6 days ago and it is currently at +6 seconds against reference over the whole time period. Yes, 1 second per day. Phenomenal. Well done Eddie, a cracking watch. Wow, that is indeed impressive! Ordered mine today, now the waiting game. One of the shots above makes it look like it has a copper dial which I like very much. 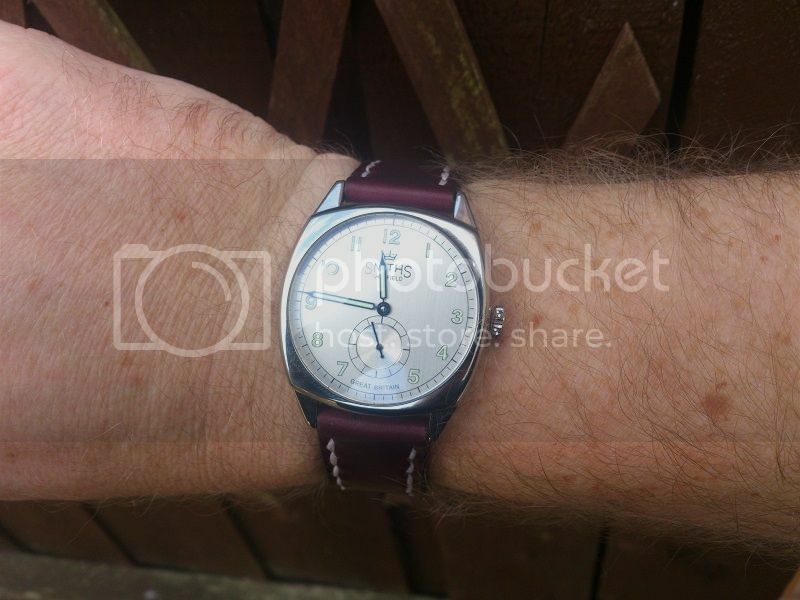 Great photographs in this thread, looks like this watch is something of a chameleon in that it can be dressed up or down and the dial colour seems to alter according to the lighting. Looks great, good job Eddie. Mine is at -14 seconds over 5 days that I've been checking it so just under -3 per day so also pretty good. I'm tempted! Will go nice next to my Everest in the box. Is this an original design or a nod to a vintage model? 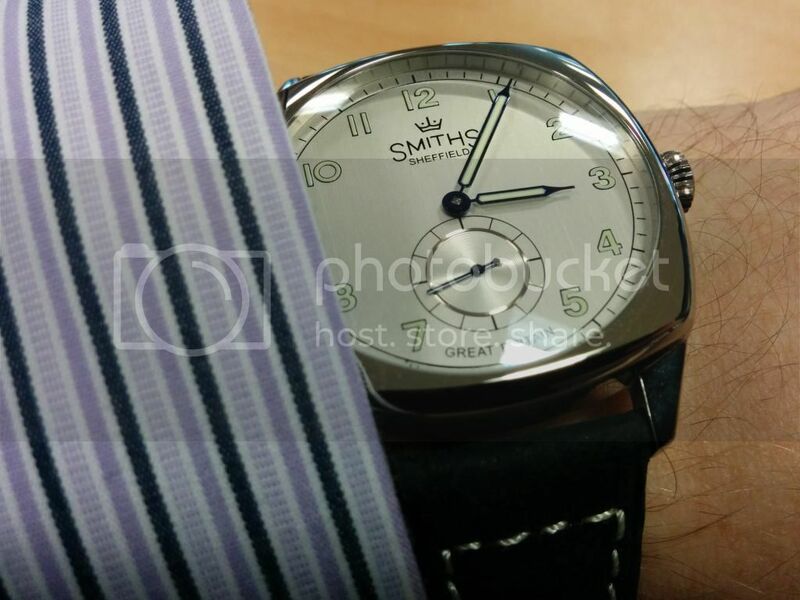 See post #15, it's a very fitting recreation of a classic Smiths. The look of this watch is beautiful to me. The numerals and track are perfect, as are the hands. 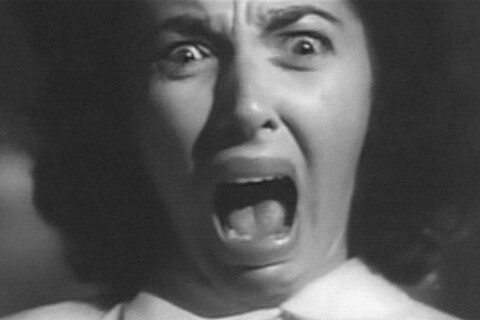 I'd have loved one forever if only the dial was silvery white as in the 50's vintage era. This dial looks a little too steely industrial to me. Still a superb look though. Time Factors is closed until Tuesday 21 October 2014. "In 1923 Charles Berner started a small manufacture in the community of Peseux (canton of Neuchâtel) for the production of movement blanks with pallet escapement. These movements were primarily intended for the watch industry's new rising star, the wristwatch. By late 1933 output by the young ébauche maker had reached 215,980 units. In 1935 the company's product line comprised some 15 different basic movements, all handwind. Products rangedfrom the 4 1⁄4-ligne baguette movement with the designation 90 (9.8 x 24.3 mm) to the oval 50 (13 x 22 mm) and the tonneau-shaped 110 (18.8 x 26.35 mm). Among the jewels of this small movement maker is the much sought after Peseux 260. In 1968 Peseux introduced its 7046 handwind movement. 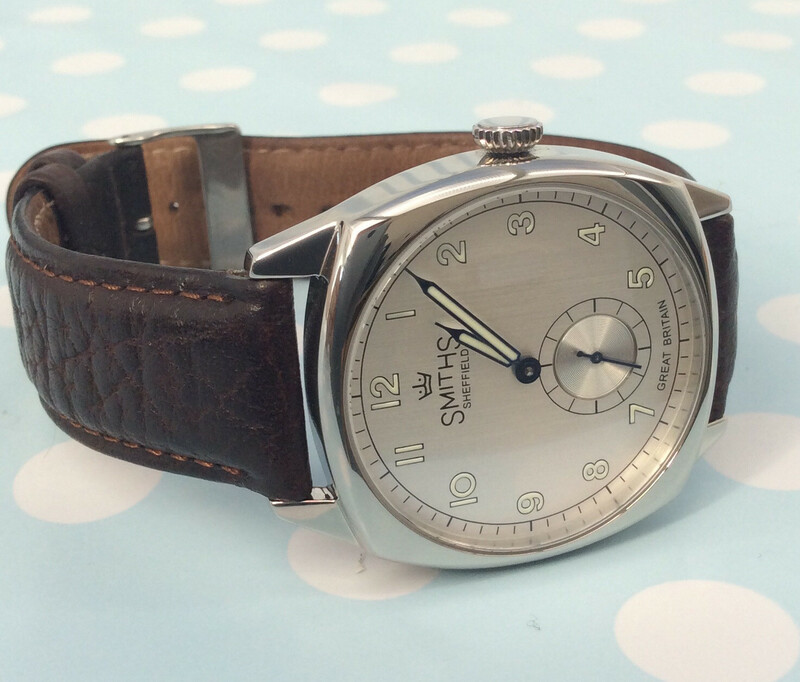 It crowned the successful 7040 movement family with small second (23.30 mm diameter). Unlike its basic 7040 counterpart, the 7046 movement included a push piece-activated date window. Balance frequency was a moderate 21,600 A/h. 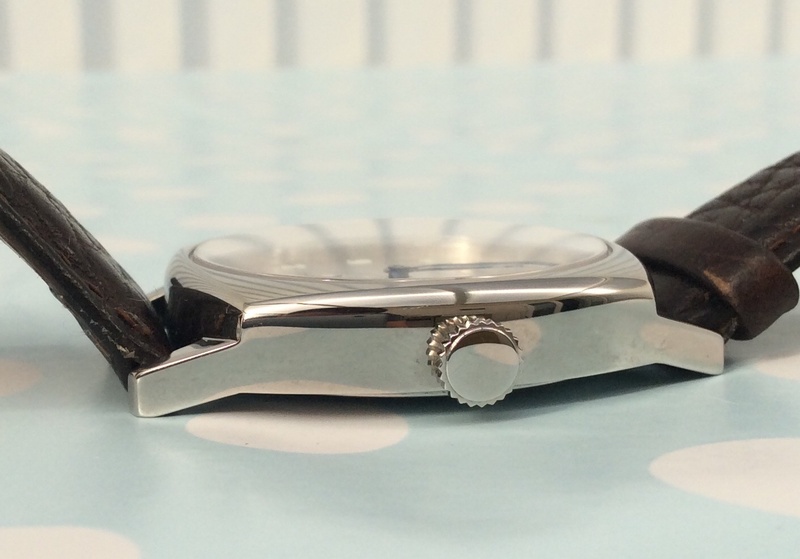 In response to a growing demand for thin watches, the different movements became available with beveled edges. Not only did the sides remain low but they also gave the impression of relatively flat cases despite a movement thickness of 3.1 mm. 1985 marked the end of 60 years of movement making. It involved the 7001 available from ETA today but launched in 1971. While the Peseux name has been history since 1985, the 60 movements developed and produced by the movement maker live on among collectors everywhere." 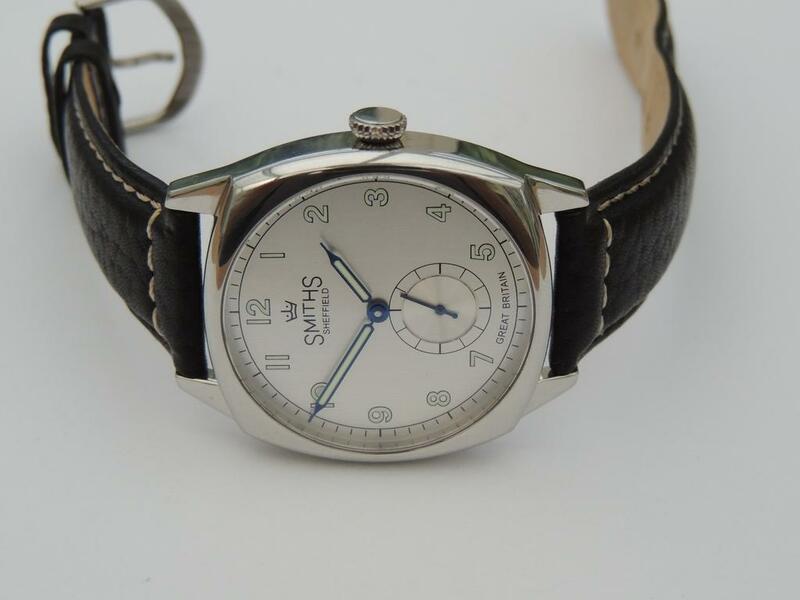 So this is a vintage style watch with a genuine NOS swiss movement that has a fine history. I thinkl Eddie said that the 7040 has a better power reserve than the later 7046. Does anyone know what years it was produced? Really really nice, well done. 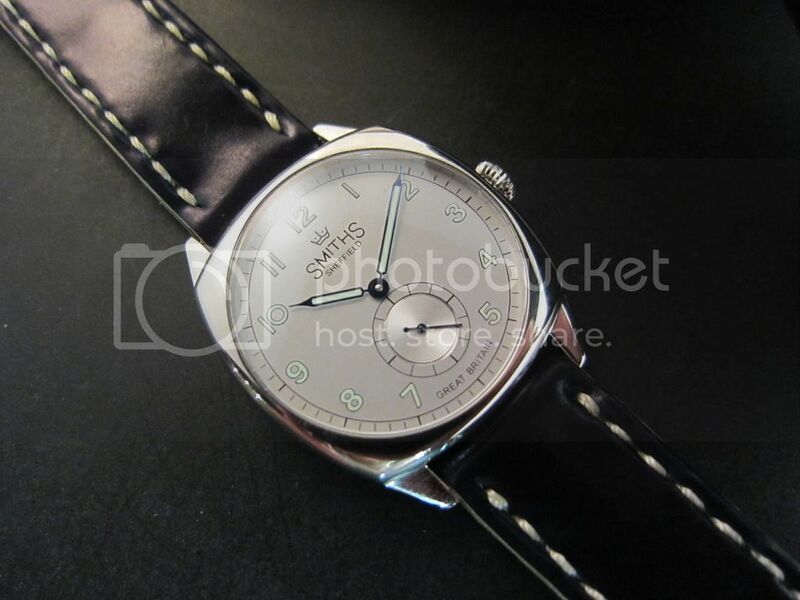 I have been away from the forum for too long, I was just about to order a Stowa MO and now I am confused. 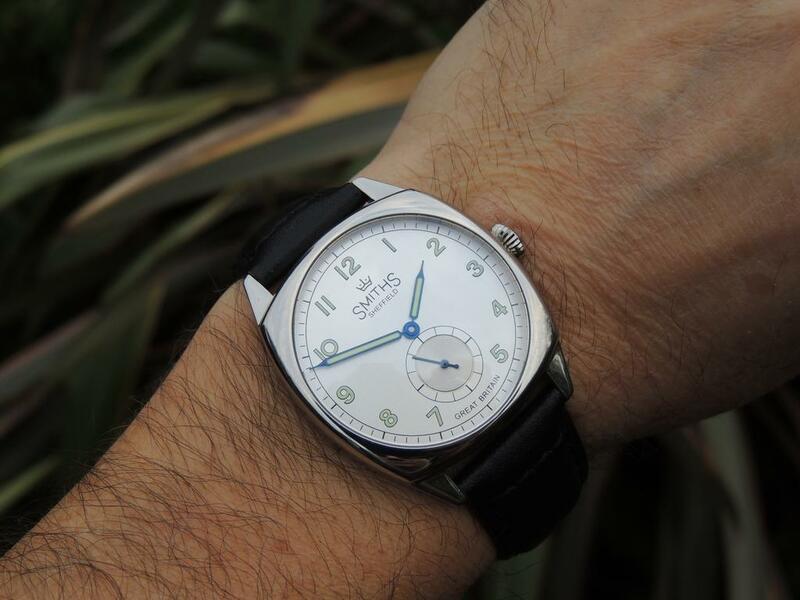 Is the Stowa too big? Any pics on an 8.5 inch wrist? Wow, that's nice. Clean and classic design. One to put on the wishlist. Coot, what strap is this? Absolutely gorgeous. Whoah there kfb! Back up a little, what's that strap? Name, rank and serial number please. That is the quite excellent but phenomenally reasonable "Bella Air-Con" from Cousins. Excellent strap really, all sizes and colours available in the design. It's got a breathable nubuck liner, calf top. Looks lovely. I'll save my pocket money for a few weeks so I can have one in brown and one in black. Absolutely love it! Unfortunately the original strap was a little tight so I ordered a snazzy handmade burgundy number from Pavstraps especially for this watch. That's a very nice present and the strap looks superb. Surely one of the best of Eddie's watches ever made. I love mine. Relatively new owner here. I love this watch! Amazing timekeeping, and I can't stop looking at the dial and the lovely blued hands. 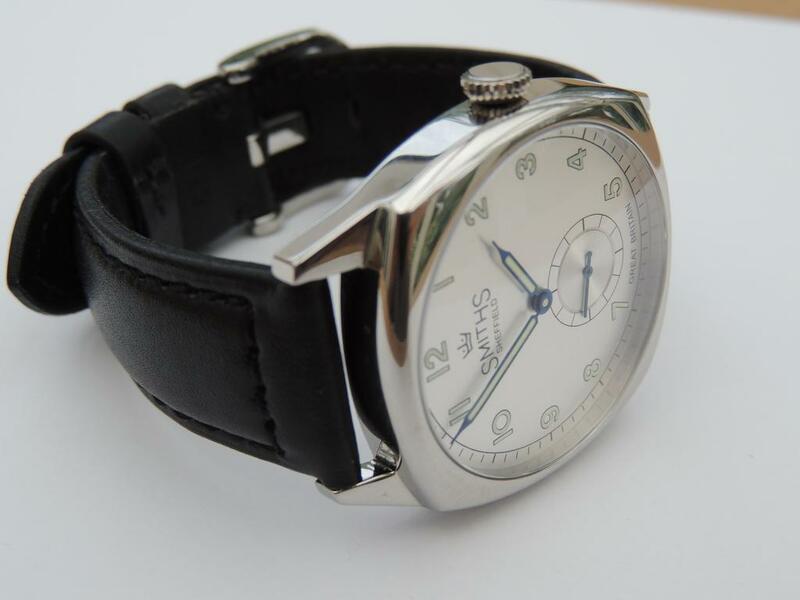 That is a stunningly beautiful watch, dress watches aren't my thing normally but hope to get one of these sometime. Thought I'd bump this thread to show off my new strap for my PRS-36. It's shell cordovan from Horween in Navy blue with ivory stitch. I love how the blue picks up the blued hands. What a great little watch -- mine just happens to be a nice little time keeper too. I'm guessing it's a custom made strap due to the single hole for the pin buckle. 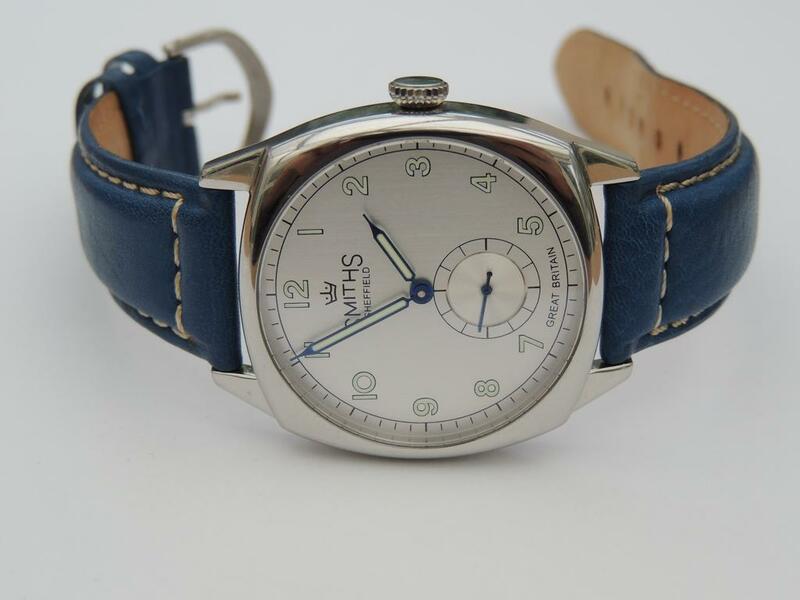 Beautiful strap, which would be perfect for the Richmond Spencer. Where do I get a strap like that made for my wrist? Thanks, guys! I live not too far from Chicago (compared to Sheffield, anyway) and make frequent trips to Horween to select the shell cordovan myself. I have a small workshop and make a few straps, but I really just wanted to show the PRS-36's many fans what a nice watch this is on Navy blue. The Navy is a new-ish color for me, and I'm really liking it. More interesting than a black strap, but still goes well with black shoes and gray trousers at work. Really like those, mines currently in a Vintage tan pigskin. Some great shots there. Cheeky request: what size is your wrist? I've been very tempted by this for a long time but it appears to wear big and I suspect on my 6.75in wrists it could look a bit daft. Ta.